The old Phuket system of taxi territories fiercely – and sometimes violently – defended against outsiders may have been destroyed, but in the minds of many of the island’s drivers it apparently still exists. So far not one driver has followed the urgings of the Phuket Provincial Land Transport Office (PLTO) to convert to driving a meter taxi, Jaturong Kaewkasi, academic officer of Phuket Provincial Land Transport Office said today (August 1). After talking to many drivers, he said, the PLTO had discovered widespread fear that those who converted to meter taxis would not be able to roam the island at will – which is the PLTO’s aim – due to the old taxi culture of exclusive territories. 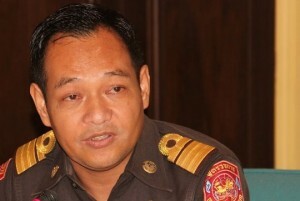 But, Mr Jaturong said, Phuket has changed in the past couple of months with the crackdown on taxi mafia activities and the arrests of some of the influential people behind them. People must change the perspectives, too, he said. “If influential people try to stop them doing their job, drivers can call 1584 and the police will take care of the matter,” he said. Registration for meter taxis is now open, and will run until the end of this month (August 31). Drivers’ cars must not be more than six years old (a relaxation of the rule that stated they must be no more than two years old). If drivers cannot initially afford to paint their cars yellow and red, they can drive for the first year with yellow and red stripes along the side of their cars. To register, drivers must bring to the PLTO a copy of their house registration book (samnao tabien baan), a copy of their ID card, a copy of the car registration book, and a copy of their license to drive a public vehicle. Once they have registered, and provided that the car has been fitted with the necessary equipment, they can start work the following day. He added that from August 9 to 12, there will be a fair at the PLTO selling equipment for meter taxis such as the meters themselves, roof lights and free/not free lights. The only place on the island where the taxi mess has yet to be sorted out the airport, Mr Jaturong said, but this is being worked on. The fares for meter taxis are currently awaiting approval from the National Council for Peace and Order. Once these are set, Mr Jaturong said, he believes they will provide the incentive to draw many drivers into becoming meter taxi operators.